Preheat the oven to 300 F (150 C). Line a 9-inch (22.5 cm) square baking pan with silicone paper. In a microwavable container, melt butter and chocolate together. In a bowl, combine pureed banana with eggs and sugar. Add banana mixture to chocolate mixture and stir until thoroughly combined. Pour mixture into prepared pan and place pan in a water bath. Bake for 25-30 minutes, or until set. Let cool, then set in the fridge for at least 1 hour before un-molding from pan. Cut into desired shapes and serve either cold or warm. 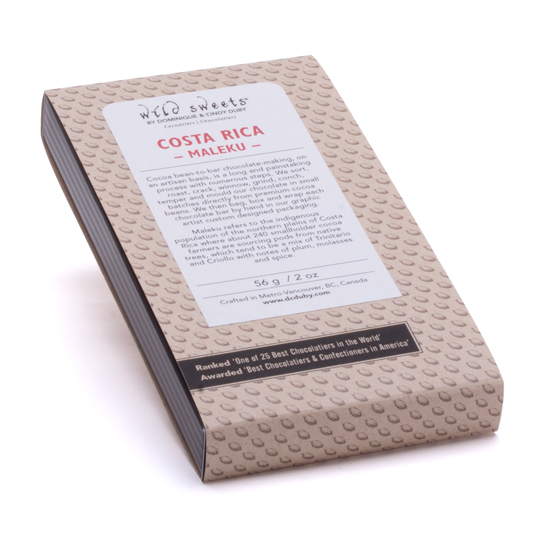 For this recipe, we suggest using our Single Origin Costa Rica Bean to Bar Chocolate with its notes of plum, molasses and spice, which are a very well suited to compliment the fruity banana notes of the pudding.